>The following is an excerpt from The Moral Underground: How Ordinary Americans Subvert an Unfair Economy, by Lisa Dodson (Copyright © 2009 by Lisa Dodson). Published by The New Press. Reprinted here with permission. On the surface, the people I met who practiced economic disobedience would seem quite diverse. They included middle-aged, white Bea, managing that big-box store in rural New England and thinking that after years of hard work, you should be able to buy a prom dress for your daughter. They included Ned, white and in his thirties, the chain grocery store manager who thought working families should have enough to eat. And also Ray, in his fifties and the son of immigrants, a community-center director for a small city, who doesn’t ask for a “pedigree” before signing people up for desperately needed services. They included Aida, a Latina in her thirties, the director of a child care center, who misplaced paperwork so that children wouldn’t lose child care and parents wouldn’t lose jobs. And they included urban teacher Lenora, in her twenties and African American, who broke school rules all the time to help out a student in her class. These and dozens of other disobedient people identified themselves as all over the nation’s social map. They were younger and older; from the West, Midwest, and East; they were Latino, black, and white; religious and not; and ranged from barely middle-income to quite wealthy. And they did not—for the most part—use words like “resistance” or “civil disobedience.” Yet they took action based on a belief in their responsibility for what was happening to people around them. The most common explanation given for breaking institutional rules was an identification with the plight of others. As Dr. Leticia put it, “There was something… that haunted me… maybe reminded me of me.” It was particularly common for women to talk about putting themselves in other mothers’ shoes and reflect on what it would be like to have to leave their children all alone. But this was also said by numerous men who described their feelings of protectiveness and concern for children. What would it be like to be unable to keep their children safe or fed? Employers, doctors, job supervisors, executives, teachers, small business owners, and others—over and above their work identity—reflected that as a parent, you know that you put your children before anything, before regulations or laws. Protecting children from harm trumps everything else. Intriguingly, this idea was also shared by childless people who expressed a sense of responsibility for children’s vulnerability that reached beyond genetic ties. They included childless Cora, who allowed children into the workplace, tried to get them homework help, and wrote up fantasy work schedules each week—all against the rules of the large franchise she ran—to help mothers take care of their kids. Hospital VP Linda treated people working for her like fictive kin and, from that angle, treated breaking rules as morally obligatory, worth risking her job to do. These moral choices reflect the idea that concern about the well-being of other people is hardwired into humanity. Steven Pinker, an evolutionary neurobiologist, describes “moral instincts” as shared human senses that include an aversion to harming others and also a universal belief in basic fairness. Deborah Stone, a political science ethicist, examines how altruism is an essential, if invisible, part of daily life found in families, in community life, and at work. Sarah Hardy, an evolutionary anthropologist focusing on maternal care, argues that the survival of offspring in human evolution required “extra” parents—she calls them “alloparents”—who provided protection, care, and resources not only to blood-kin young but to others too, who were treated as kin. And the sociologist Patricia Hill Collins examines how “othermothers” are critical to family survival where families are struggling, particularly in African American, ethnic minority, and low-income families that do not have the income that middle-income families rely on. These child labor activists challenged all adults of the society— not just biological parents—to consider preventing harm to children a social responsibility. Bolstered by the unflinching photographs by Lewis W. Hine, the public face of ruthless business practices came home. One of Hine’s photos, captioned “Leo, 48 inches high, 8 years old, picks up bobbins at 15 cents a day,” shows a worn-out little boy looking you straight in the eye—it is hard to ignore him. Looking back now, it is startling to recall that it took decades to end child labor. Yet the power of the business lobby was as formidable then as it is today. Business interests, with strong allies in Congress, argued that “market freedom” justified the use of children in the mills, in much the same way that plantation owners justified the need for slavery. It is the essential position of the marketeer; these are economic negotiations, not moral debates. Yet I found that the taproot of child advocacy, though not now part of a social movement, nonetheless is widespread. The most common grounds on which middle-income people claimed the moral right to break the rules or the law was in relation to children’s need for care and protection. Mary Jane, a retail sales manager in Denver, told me a story about a mother—Jenna—who called in sick when she had no sick days left. The fast-moving retail store that Mary Jane managed really needed “all hands on deck,” but Mary Jane was also surprised that Jenna would call in, because she was sure Jenna wasn’t really ill, and she was “really responsible.” She called Jenna back and wheedled her into telling her the full story. On her way to work, Jenna had dropped her baby off at day care without diapers because “she just didn’t have the money to buy them.” The head of the day care center said she couldn’t take the baby because it was the third time Jenna had done this, and that meant that the staff had to use other children’s diapers— other families’ resources—and it wasn’t fair. Jenna had begged them to take the baby, explaining that when she got her paycheck, she would “buy a bag for everyone else.” But the child care staff felt they had been as flexible as they could—they had to “draw the line somewhere.” Mary Jane told me that she was angry and in a way ashamed: “I know what Pampers cost and I know what Jenna makes, and… as it is she ’s got to be cutting back [on everything else] just to buy them.” Mary Jane bought a bag of Pampers and drove over to the day care center, so that day’s problem was solved. And really, Mary Jane told me, you can hardly blame the child care staff, because they can’t really “steal from Paul to pay Peter”; that would be unfair. But Mary Jane found that the incident stuck in her mind. She imagined what it must have felt like for Jenna to be holding her child, all stressed out, and begging the child care worker to take her, without having diapers or clothing or any of the things a proper mother has when dropping off her baby. Could the child sense what was going on? And then Jenna having to leave, no doubt feeling humiliated, and then calling in to work and telling a lie because telling the truth was too embarrassing. Mary Jane said she “just hated to think about it,” though really she knew that it was such a small incident in comparison to what goes on in many families that don’t have the money to care for their children. But it was that moment that shifted something for Mary Jane. She said she realized “this is [about] more than… just one kid.” She began to buy various items that helped out the mothers who worked for her, but that seemed so small. So she began to divert some of the available resources from the store, various “goods” that could get overstocked. She found ways to share the company’s wealth because the wages the company paid did not. Mary Jane said, “As a mother, I just couldn’t act like this was okay. I felt like I had to do something.” And finally, “something” for just one mother, just one time, wasn’t enough for Mary Jane. Others too used their identity as a mother or the idea of kinship to assert their moral ground. When Cora in Boston—who put kids before scrod—called the women who worked for her “family,” so, by extension, were their children. She was establishing a changed backdrop, pushing the norms of American business where human harm is irrelevant. She sketched out a landscape of relationship. In this terrain you get to act according to different principles because we all understand that kin ties are precious, and they come with obligations. By moving her employees into kinship space, Cora staked out the right to treat them in humane ways, and that included acting as though their children mattered. This was precisely what Bea—who laid away prom dresses— meant when she said, “It gets messy quickly.” Bea was talking about the mess of human relationships from which one ought— according to business professionalism—to remain clean, or in any case anesthetized. That didn’t work for her. She said, “I can’t keep my distance.” Yet Bea had come to terms with her own conscience, and those terms started with treating the people she worked with as though they have value. Being a parent—or as good as one—opened a door for many people, and the opening turned out to be wide enough for more than just their own children. For some people, the meaning of as a parent turned out to be as a brother or sister and a son or daughter too. Because increasingly, the problems that people bring with them have to do with other fragile kin. A manager in a hotel chain spoke of her sister’s bipolar disorder and how she often had to take time off unexpectedly to deal with her sister’s emergencies. et—in turn—she was supposed to fire service staff “who don’t even get the paid days [she does]” when they had family crises. She worked around those rules and had even found ways to “extend” the health benefits that managers got so that they reached a few down below, because it just didn’t seem fair to her. More and more frequently it was aging kin who were mentioned as a key care issue among middle-aged people, who are juggling parents’ needs with work and often still supporting growing children. I heard the rhetorical question “How do they do it when I am beside myself with being pulled in every direction?” “How do they do it on twenty-five, thirty, or thirty-five thousand a year [double what we call the poverty line]?” Middle-class, middle-aged people shook their heads at the thought. Angela, well educated and wealthy, remembered facing the despair of being unable to protect herself despite her advantages. Getting real help—not words or commiseration, but concrete help—made the difference. And from there, as happened to so many of these people who decide to act, her perspective fanned out to include a wider range of vulnerable people with whom she identified. “We’ve got to take care of each other,” Angela said, and if your company or institution or government doesn’t, well, you do it yourself. Once in a while I heard about collective acts in discussions about local conditions and the treatment of others—in one case even immigrant neighbors. Americans have long been unsettled in their views about hardworking—and often economically desperate—immigrants who reside in local communities or make use of public institutions. This ambivalence is not surprising; ours is a capricious history when it comes to immigration. We have welcomed immigrants as the nation’s future and also called them a scourge; we have enjoyed their cheap hard labor while challenging their children’s access to public schools; we have opened doors leading to immigrants’ offspring becoming major social and political figures and then erected walls to bar others from entering. We are deep in the latter national temperament right now, yet throughout this research I met all sorts of people who found this a troubling attitude. While everyone said that there have to be laws, they also said “we are a nation of immigrants.” We were all foreigners at one time or another. Other than the American Indian people, as a teacher in New York pointed out to me, “you ask about families, almost everyone will tell you” about another land that their people once came from and how that matters to them. “Kids love to tell their family’s cultural history.” So, are only the old immigration histories to be valued and the new ones to be eradicated? And how, then, do we mark the divide? In some places this becomes a town line. In a modest town in the United States that sits on the border between the American Southwest and Mexico, several hundred children mill around their bus stop waiting to go to school every day. Many cross the border line to get on the bus. They live in Mexico but are American because the only hospital in the area is on the U.S. side of the border. So both Mexicans and Americans go to the local hospital to give birth, and later these children attend school together on the U.S. side of the border. They grow up together. When there’s a fire in the small town on the Mexican side of the border the American fire trucks race over the crossing to put it out, because the Mexican town doesn’t have a fire station close by. When a person is injured in the Mexican town, an ambulance speeds over to bring him to the only available hospital, on the U.S. side of the line. It’s what those people do—put out fires that burn up homes or deliver people who are injured to the care that they need. And it’s what the teachers do at the local schools—they educate children, in this case children of two nations. The route to the schoolyard differs for the two sets of kids, but they come with the same need to learn. At one time, several years ago, an effort was afoot to bar the children from the southern side of the border from crossing over and coming to the school. It was argued that “we” shouldn’t pay for their education, even though for decades children who had been educated at the school had grown into adults who worked in the United States as well as Mexico. They provide labor, taxes, family life. Some, no doubt, join fire departments and work in hospitals and in schools. They replenish the well from which they have drawn. But in keeping with a time when children’s needs and injured people’s lives were being measured by cost and market gain, a campaign emerged to cut off half a community. It didn’t work. Lots of the Americans objected—they had grown up with this tradition of neighborliness that crossed borders. And some— enough, it seems—were repelled by the notion that south-of-the-border children would be kicked out of the school. The Americans had grown up with the parents of these kids, some Anglos, some people of Mexican descent, and many a mix of both; this was a place that had been tested. And it turned out that local humanity trumped lines on a map. Recently I visited this town, and despite the “conservative” times and the rain of anti-immigrant rhetoric, people seemed to be going about their daily business: kids from either side of the line were being educated, ambulances and fire trucks still responded to basic human need. I visited another smallish American town in rural Maine. The people in that northern county weren’t dealing with borderlines, but they were also talking about neighbors and the market erosion of common fairness. It was the summer of 2008, when oil prices were nearly $150 a barrel. I was listening in on town talk at a weekly farmers’ market and heard an impromptu discussion. Among a throng of local shoppers a few had started talking about oil prices and how neighborhood families and particularly elderly people in the county were likely to freeze in the coming winter. “Just freeze to death,” I heard said in an agitated voice. Just then a middle-aged woman, who had been talking to friends, suddenly turned around to face other shoppers and asked, “What’s happening to us? Why doesn’t the government do something?” A local farmer, sorting vegetables nearby, responded immediately, “The government is the same as the oil companies. There’s no difference. We can’t wait for them to do anything.” A young mom holding a baby as she stood in line said, “So what do we do?” There was no single response, but they were looking at each other to find it. Over the years I’ve heard people say, “As the daughter of immigrants…,” or “As a black man…,” or “As someone whose dad always worked with his hands…,” or “As a single mom who once needed public assistance. …” I heard “As a Latino mother…,” “As a gay man…,” “As a Christian…,” “As a survivor of domestic violence… ,” “As the daughter of a guy who committed suicide [after his family farm was bankrupted]…” Of course these prologues established a personal biography, but they did more than that. When I heard someone open with “As a black mother…,” I heard a murmur of history, voices from generations who taught that the survival of tomorrow’s children matters more than rules or laws. When I heard someone say, “As an immigrant’s son…,” I could almost see the previous generations of “aliens,” scarves on heads and hats in hand, that the speaker lined up to explain his way of looking at legality and borders. When I heard, “As a woman who’s been abused…” I knew that the account would be personal but also about power and the understanding that sometimes those who hold it won’t protect you. Most people start with the personal, but some of them move on. They use their story to establish links with others and then, with that stronger connected identity, have the courage to face bigger questions about our society. There have been many stands against unfairness in American history, and they were named by these ordinary people who chose to act upon injustices in their midst. And that’s when they started to sound alike; while personal roots, claims, and family histories were used to explain a turn to disobedience, the accounts began to echo each other, blend together, and become a common America. 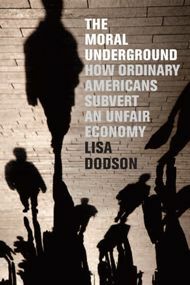 Lisa Dodson is a professor of sociology at Boston College and the author of “The Moral Underground: How Ordinary Americans Subvert an Unfair Economy” (lisa.dodson.1@bc.edu). She lives in Auburndale, Mass. © 2011 The New Press All rights reserved.